94 backers pledged $4,127 to help bring this project to life. SOBURIN HAS NEED FOR HEROES! 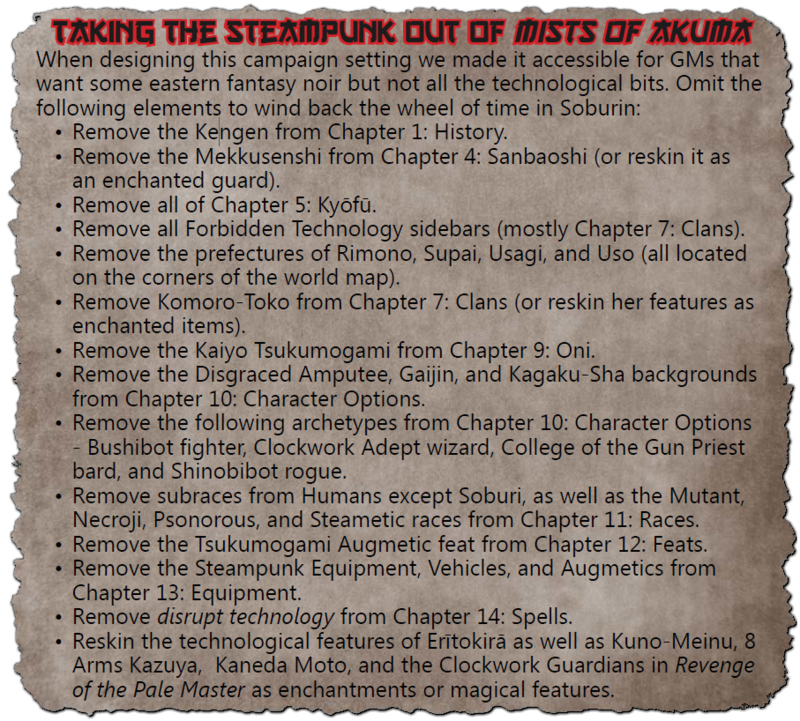 Mists of Akuma is an eastern fantasy noir steampunk campaign setting funded on Kickstarter in 2016—a world that fears technology, the only thing that might save it from the primordial fog transforming the subjects of Emperor Hitoshi into vicious adeddo-oni (and built with GMs tired of steampunk kept in mind). Fifth Edition players! Check me out on Google Drive! HAIL TO THE DEMON LORD! This Kickstarter is for two different hardcover books for D&D 5e and the Shadow of the Demon Lord RPG: the already complete 338 page Trade War and the Imperial Matchmaker mega adventure. TRADE WAR (journey across Soburin on quests before a battle and race up Hone-Noroi Bone Keep) collects the six existing Mists of Akuma adventures into one book with connecting chapters to carry the campaign from one module to the next (for folks that already have the softcover adventures there's a shorter 132 page softcover supplement available). TRADE WAR: The adventurers face off against their first great challenges near and within Robai-Shita Temple in Shibai, traveling all over Soburin as the Mubō Brothers seek vengeance for their murdered brethren while fate puts the party onto the trail of nature demons and black torii gates of mysterious purpose. After meddling in the affairs of two of the immortal Imperial Siblings, staving off rebellion in Samon, saving Fuson Prefecture from a reign of terror, and deciding the fate of a secret oni city, the PCs run afoul of the ancient Pale Master's servants in Kizaki! Soon the powerful necromancer's bone keep appears as various armies are mobilized leading to a climactic siege against undead legions followed by a harrowing invasion of Hone-Noroi Keep's nine hellish levels where the party either defeats the Pale Master once and for all or become his thralls! With 50 maps, over 100 NPCs and monsters, and an already proofed print version, it'll keep your table shoulder-deep in action-packed adventures for months and months of excellent gaming. IMPERIAL MATCHMAKER (webs of intrigue between the nobles of Soburin in a highly-detailed metropolis) is being forged with the help of the talented Savannah Broadway and Michael McCarthy. This sprawling exploration inside of the imperial capital of Sanbaoshi is brought to life with illustrations from world-class artist Claudio Pozas, Nathanael Batchelor, Jacob Blackmon, Indi Martin, Renan Moraes, Sara Shijo, and Hope Swain. Over half of Imperial Matchmaker has been written and playtested already, and with your help I'll be able to bring in my Canadian-counterpart (McCarthy) and Savannah to put the final elements of the book in place with all the polish (and beautiful artwork) it deserves. IMPERIAL MATCHMAKER: An enmity between the Gekido, Hakaisuru, Kirai, and Namida clans has persisted for ages, the wounds from the Battle of Broken Spears torn open every few years by border skirmishes and trade disputes. Seeking to win the minds of the people by a grand gesture during these dark times, Emperor Hitoshi Masuto has arranged an alliance between the quarreling noble families—20 brides and grooms have been chosen to wed in celebration of the 10th anniversary of the decisive final battle in the rebellion against more than a century of foreign occupation. Groups that are playing through Imperial Matchmaker for 5E receive this book of pregenerated characters (levels 3rd through 10th) available to either use themselves or for the GM to make adversaries the adventurers compete against amidst the intrigue in Sanbaoshi! Several of the capital's locations tie into sub-plots for these iconics, encouraging players to explore the city as they try to help (or hinder) the Imperial Matchmaker's arranged weddings. Backers at $19 and up get one or more at-cost vouchers for print copies of Trade War, Imperial Matchmaker, and the core Mists of Akuma setting book. Your Kickstarter pledge pays for the PDF(s) and you get access to a physical copy of the books(s) for the cost of the ink, paper, glue, and shipping. Please note: These are estimates from the start of September 2018—the price for ink, paper, glue, and exchange rates fluctuate—and they are likely to change before Imperial Matchmaker is released. These estimates do not include shipping costs or increases to cost from an increased final page count (the price calculator is located here). In the interests of making these the absolute best books they can possibly be the entirety of the budget is laser-focused on development. Offering complete physical copies as pledge rewards creates limitations that Print-On-Demand and at-cost vouchers do not have to accommodate—for example, 20 additional pages of content are developed for Imperial Matchmaker, and 200 people are getting a print copy, adding those to the book costs $0.71 cents a book (which would translate to $142 not calculated into the funding goal). I've run several Kickstarters using vouchers as rewards and only one with a direct print copy available from the start: Hypercorps 2099 (a cyberpunk superhero world for Pathfinder/5E). While backers embraced that print option, it forced limitations onto both the creative and development processes of the book that frankly didn't need to be there, and due to a relatively incremental increase in the cost of paper and 20 extra pages of content, fulfilling rewards nearly bankrupted me (although I still released the larger book because that's what folks deserved to get). While it's still a wonderful book and fulfills the original vision for Hypercorps 2099, there was no way to vastly over deliver and make a bigger, better book (like the Veranthea Codex [doubled estimated page count], Book of Exalted Darkness [also doubled estimated page count], and first Mists of Akuma Kickstarters [150% estimated page count]) and my goal here is to make these the best they can be. There are more people in the wings for stretch goals (Andrew Engelbrite, Dirk van de Rijt, Brandes Stoddard, Robert Lashley, Chris Davies, and others) and I'm excited to reveal what they've got planned—but can't do that until we get past the first one! This first new designer is someone you probably have seen the writing of but only under his Twitter handle: @dr5bludgeoning. Jeremy is more than just a wellspring of hilarious D&D tweets however and he’s got a great creative streak 10 miles wide that I’m keen to see get unleashed with some badassery in Mists of Akuma. Guy Larke has more practical experience with martial arts in RPGs and is living it up in South Korea when he’s not imagining tabletop adventuring in eastern fantasy—a perfect fit for this project! Andrew Engelbrite is the best and brightest of the contributors I've gotten to work with on EN5ider and his sidequest is perfect for Mists of Akuma: a synthesis of traditional tales presented in a journey that becomes more difficult the further the party goes, ending with a final battle worthy of Soburin. This stretch goal has been unlocked! The images of the iconics in the free PDF are not quite finished, waiting for the project to finish funding before final touches and details are given the last brush strokes--but when we hit this stretch goal the Mists of Akuma iconics are getting FULL FIGURES for page-sized printing in the Imperial Matchmaker: Guests book! At the time of this writing there's still more than a day left to go and more stretch goals in the wings so keep this page handy! Speaking of Mists of Akuma videos, the Midgardia RPG group is playing through Mists of Akuma: Scourge of Róbai-Shita Temple! You can watch the game live on their Twitch channel every other Friday (next game is September 14th), catch up via YouTube (episode #1, episode #2) or listen in to a podcast of their actual play. I've run and fulfilled several Kickstarters. Aside from freelancing gigs and my job as the editor of EN5ider, this will be my primary focus for months. In the unfortunate event I die from over-work or force majeure, I'm 100% positive that my design team will pick up where I left off to finish the job. Thank you for checking out the project page! Your adventurers best be prepared for a lot of intrigue, sneaking about, and chaos in the imperial capitol of Sanbaoshi! HAIL! Blood will run in Sanbaoshi before your quest reaches its end! We'll be traveling all over Soburin, thank you very much. Our journey knows no bounds and the Pale Master doesn't stand a chance against us! The Demon Lord demands this urban adventure of eastern fantasy in print form! Games are best played when there's paper involved and that's how we're going about saving Soburin! Soburin will never be the same after we've tackled it with glue, binding, ink, and paper! Give us the grand tour of Soburin—our katanas are sharp as hell and our spellwork is to die for! The Demon Lord cares not for the forms of these sacrifices, only in their potency as kickass adventures! We can do without the paper bits and are prepared to devour both of these epic campaigns in their digital forms! The Demon Lord will be most pleased with us for acquiring these tomes and we swear no person shall be bludgeoning by their hefty weight. Honest. When we're done busting through Trade War it deserves a place on the shelf as we delve into Imperial Matchmaker! You're an avid gamer of many tastes—both for the offerings of Dungeons & Dragons as well as what's served in the Shadows of the Demon Lord—so you're getting ALL the PDFs! The Demon Lord may encroach upon the lands of Soburin but we'll have our say before the final day! Our adventuring party shall truly know Soburin before we conquer it! You're an avid gamer of many tastes, and you want it all not just for one system but for both, and by golly you'll have it on shelves both digital and physical! All of Mists of Akuma will be at your fingertips! You're getting everything on offer for both D&D 5E as well as Shadow of the Demon Lord but more importantly you'll be contributing to Imperial Matchmaker! Mike Myler will work with you to craft an intriguing and engaging NPC to include in the mega-adventure and one of our artists will make a complete illustration to accompany the statblock. How involved you want to be with this extra reward is entirely up to you!